CONCRETE Installation, renovation, repair and maintenance of cast in place concrete structures including foundations and structural concrete components including such incidental or related work as is customarily performed by those in the concrete trade. CONSTRUCTION MANAGER AT RISK (GROUP C) The undertaking of general contracts for the construction of buildings (i.e. new construction, renovation, rehabilitation, alteration, addition, etc.). The contract must include a variety of construction practices and supervision of a minimum of three sub-trades. Includes buildings that are truly custom, requiring extensive detailing, or that have large amounts of integrated scientific or complex mechanical/electrical equipment in order for them to function. Examples include hospitals, chemistry buildings, special collections buildings, historic preservation to a landmark structure, and/or any other structure that is truly one of a kind within the State's inventory. The construction manager at risk serves as a general contractor and provides consultation regarding construction during the design of the building and through the construction. Note: If you are prequalified for Construction Manager at Risk under Group C, you are automatically prequalified for Group A and Group B. To prequalify for Construction Manager at Risk under Group C, you must have a Major Contractor Registration through the State of Connecticut Department of Consumer Protection. GENERAL BUILDING CONSTRUCTION (GROUP C) The undertaking of general contracts for the construction of buildings (i.e. new construction, renovation, rehabilitation, alteration, addition, etc.). The contract must include a variety of construction practices and supervision of a minimum of three sub-trades. Includes buildings that are truly custom, requiring extensive detailing, or that have large amounts of integrated scientific or complex mechanical/electrical equipment in order for them to function. Examples include hospitals, chemistry buildings, special collections buildings, historic preservation to a landmark structure, and/or any other structure that is truly one of a kind within the State's inventory. Note: If you are prequalified for General Building Construction under Group C, you are automatically prequalified for Group A and Group B. To prequalify for General Building Construction under Group C, you must have a Major Contractor Registration through the State of Connecticut Department of Consumer Protection. GENERAL TRADES The undertaking of general contracts for the construction and/or supervision of several sub-trades but not the construction of buildings as described in General Building Construction. The contract must include a variety of construction practices and supervision of a minimum of three sub-trades. The work of this category is intended for the interior finishes of a building. SITEWORK Work customarily performed by this industry, including earthmoving activities, installation of drainage systems, utility systems and horizontal paving work not requiring mortar. WATER TREATMENT PLANTS The construction, rehabilitation and/or reconstruction of sewage treatment plants, water treatment plants and ancillary works. 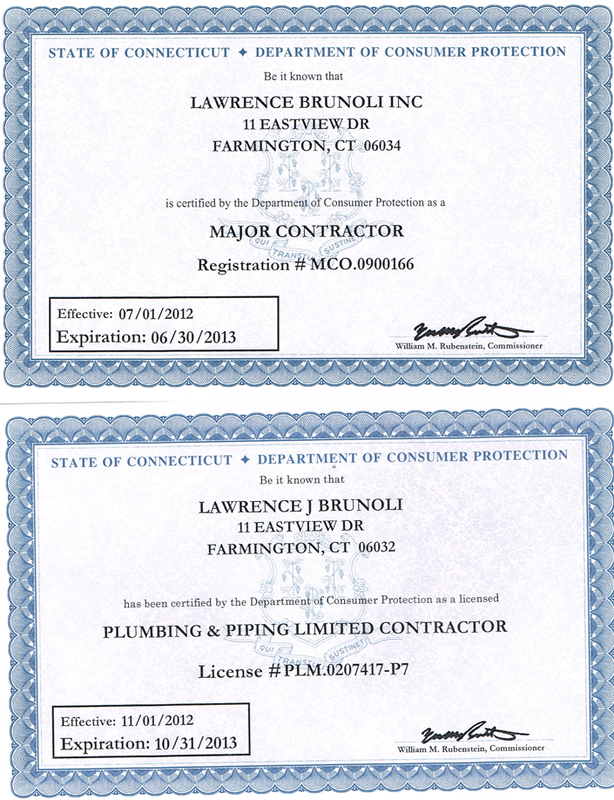 To prequalify for Water Treatment Plants you must have a Major Contractor Registration through the State of Connecticut Department of Consumer Protection. 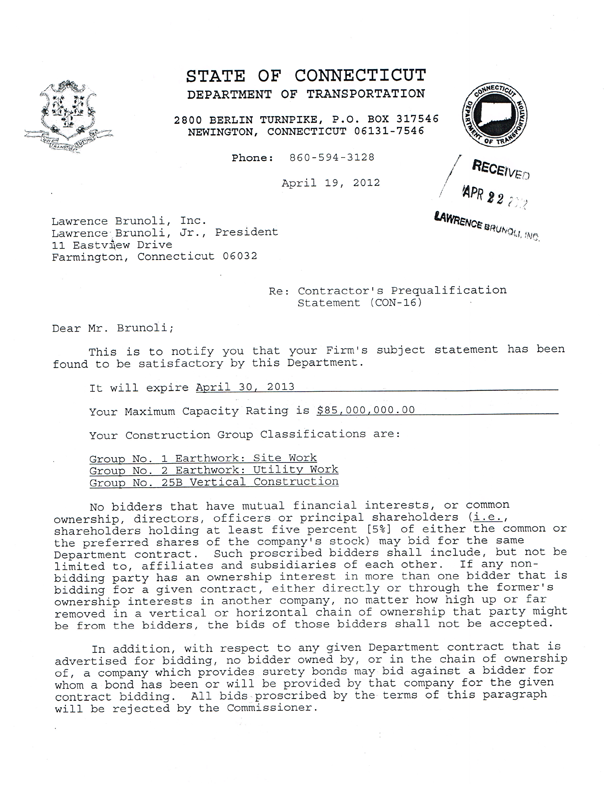 This certificate prequalifies the named company to bid solely. It is not a statement of the company's capacity to perform a specific project. That responsibility lies with the awarding authority. Company Licenses/Registrations: It is the contractor's responsibility to update their licensure information by editing their electronic application. 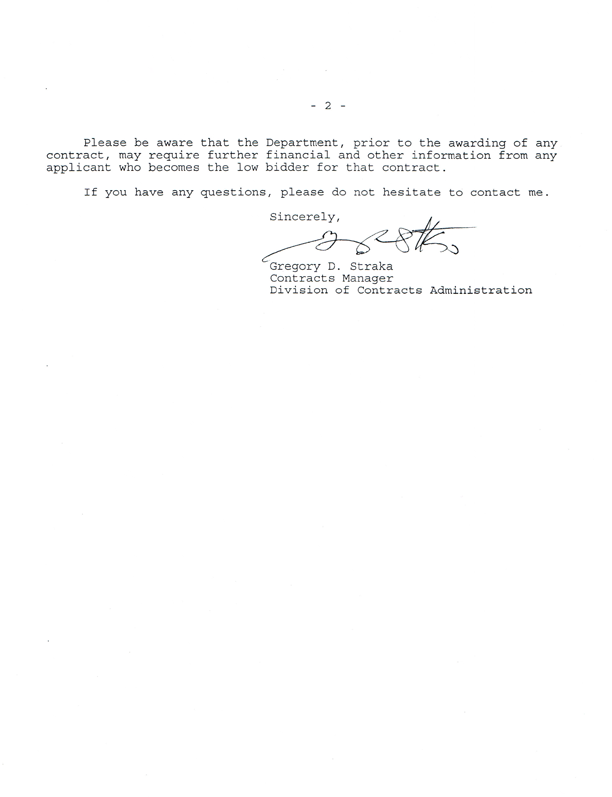 Licensure is confirmed by the DAS at time of initial application and at each renewal. It is the Department of Administrative Services' (DAS) recommendation that all awarding authorities verify the above information by visiting the DAS website: http://www.das.state.ct.us - click on contractor prequalification (under the business section). For information regarding the DAS Contractor Prequalification Program visit the above mentioned website or call (860) 713-5280.